Welcome to The TV MegaSite's Being Human Site! WE ARE BUILDING THIS SECTION AND REDESIGNING OUR WHOLE SITE, SO THERE IS NOTHING WORKING YET IN "BEING HUMAN" EXCEPT THIS MAIN PAGE! 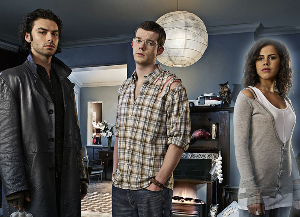 "Being Human" is a British fantasy show about a vampire, a werewolf, and a ghost, all of whom share an apartment (a "flat"). It is a very good, exciting, fun, show - with great writing and acting. Along with the fantasy, we really feel for the poor "monsters" who are struggling to live normal lives. New Being Human Appearances Page, News Page and Spoilers Page! Win the season 2 DVD! Come visit our Primetime Forum to talk about Being Human and read lots of TV news!!! Returns in 2012 for the 4th season! 1/23/12 Do You Really Want To Hurt Me?